After a quick 33 minute match on Wednesday, the Brazilian pair has beaten Broder and Valijas in seven straight pairings. The first set started off a back and forth battle until Antunes rattled off three kills on the Canadian to take a 13-8 lead. From there the Brazilians attack was too much for the Canadians to handle, taking the set 21-11. The Brazilian pair started the second set strong taking an early 7-2 lead. The Canadian’s tried making a comeback but couldn’t get anything going, dropping the set 21-18. The Switzerland team dominated the Argentinians in a fast 25 minute match. The first set was close to start with a battle at 6-6, but the Switzerland pair pushed forward rattling off point after point on Argentina to end the set 21-15. Heidrich took charge in the second set after the Argentinian’s kept it close in the beginning at 7-6. Heidrich put up three monster blocks and three kills to put the team ahead 14-7. From there it was all Switzerland, taking the set 21-11. 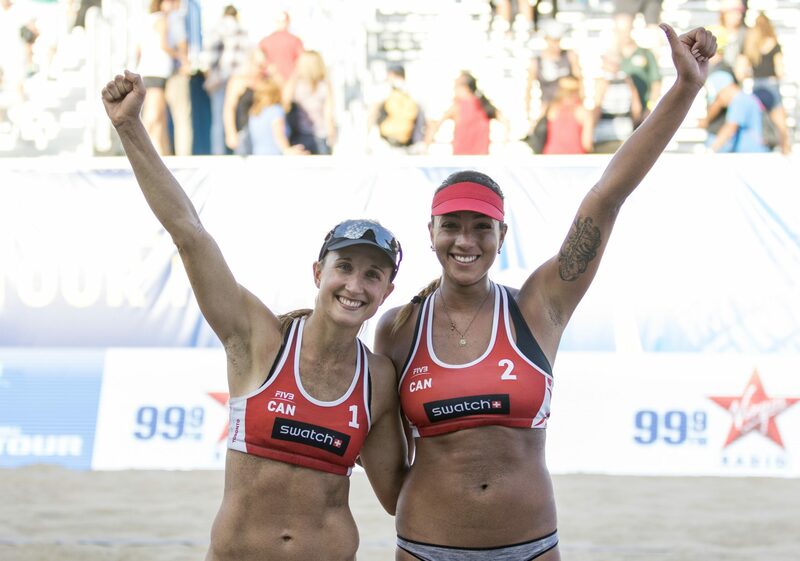 Coming off a big win last night, the Canadian pair won their first ever international Beach Volleyball event together. The Canadians didn’t waste anytime the first set, jumping to a quick 10-4 lead over the Italians. Italy couldn’t keep up and dropped the set 21-14. The Italians didn’t give up easily, making the beginning of the second set a challenge with a 10-10 score. Canada finished the match off on an 11-2 run, ending the second set 21-12. This match provided more confidence for the newly-formed Canadian duo of Bansley and Wilkerson after winning the special Canadian play-in match on Tuesday. The Switzerland pair wins in 29 minutes over the Australian pair, holding a 4-3 lead in overall matches won in meets between the two team in the FIVB World Tour series. The first set was a close battle at 17-17, until Switzerland took charge and finished off the set on a 4-0 run. The second set was close early at 9-8, but Switzerland ended the set on an 11-5 run, taking the set and match 21-13.